B safe 1st always... that is the message - Illness? Psychotic depression? No mental illness found? Well apart from the fact that the main Psychiatrist has said I have no mental illness he could find (and I do?). 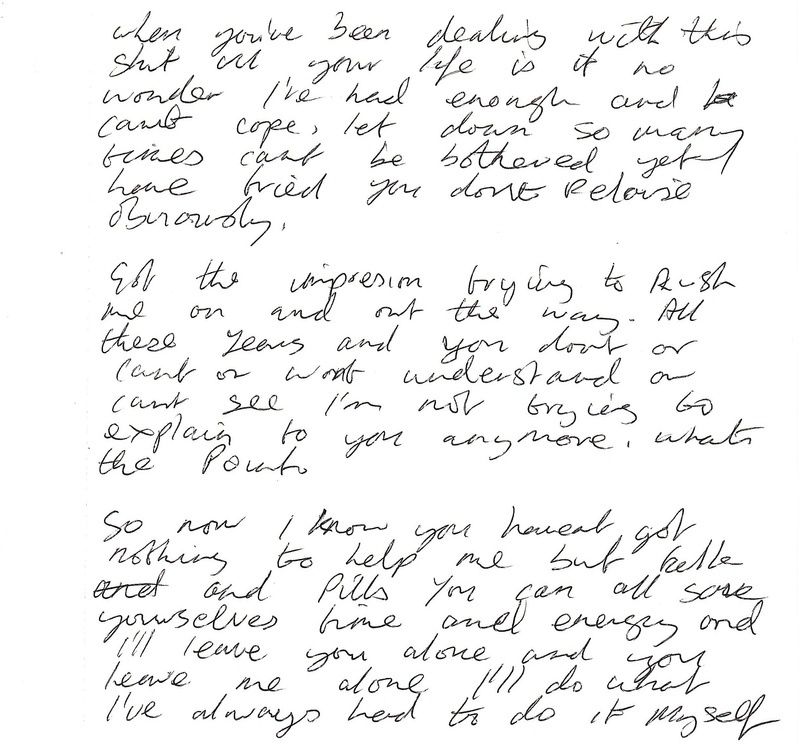 One of his nurses wrote as I was admitted to a Psychiatric Hospital in 2001. That one of his consultants believed I was suffering from Psychotic Depression. Which I was told and treated for. See below. Also when the above talks about VIDEOS which has been taken totally out of context by them. It was a simple way for me to explain to them that I have as some others do a very active imagination. Now I believe there are many reasons why this is. As others the kind of imagination you can have as a child most lose. Yes mine can be visual but not as in actually seeing things. Unfortunately they took it upon them selves to try and stop this by knocking me out and treating it as a problem but in itself is a very normal thing. What was going through my mind I would admit I needed help but that is why I asked for it. The conclusion to this would be being in hospital starting to forget who I had been. Truly frightening. Now to continue about the Psychotic depression. 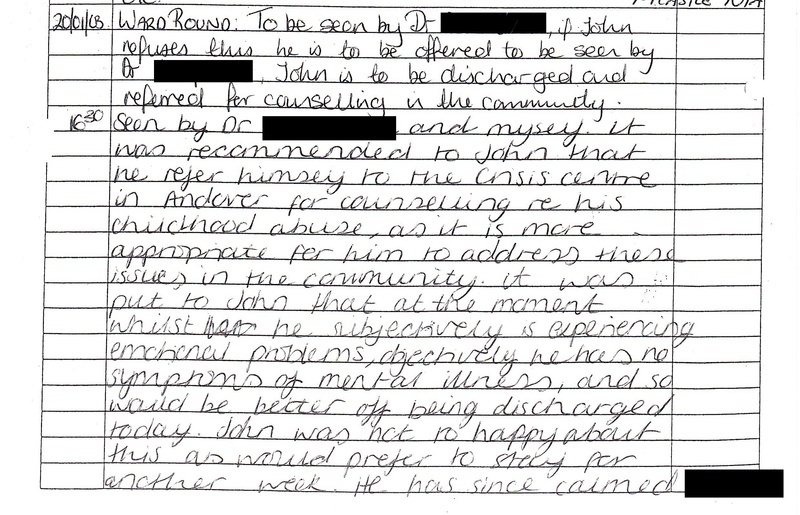 Now unbelievably in one of my stays in that Psychiatric Hospital there was a meeting with me one of his other consultants and a nurse (from the hospital who documented this you will see below). The CMHT were saying I was not mentally ill. And I didn’t need no help from them. And that I was to be discharged. Mmm confused? I’m sorry but you will be more confused. But do you remember that vulnerable frightened person? The nurse (I don’t doubt she felt I was not unwell as I have never met her before) she was saying while on the ward no mental illness was noted. She said "its not as if your Psychotic or anything". Now the CMHT consultant just sat there and said nothing. It was them CMHT who mentioned me having Psychotic Depression a few times previously. But it now suited them to ignore this small fact. I sat there I couldn’t believe it. I just knew where it was all going denial and to be sent away I was wasting there valuable time there was nothing wrong with me. Like it was all in my head (as in not mentally ill though?). It yet again seemed to suit them to deny I was even ill. 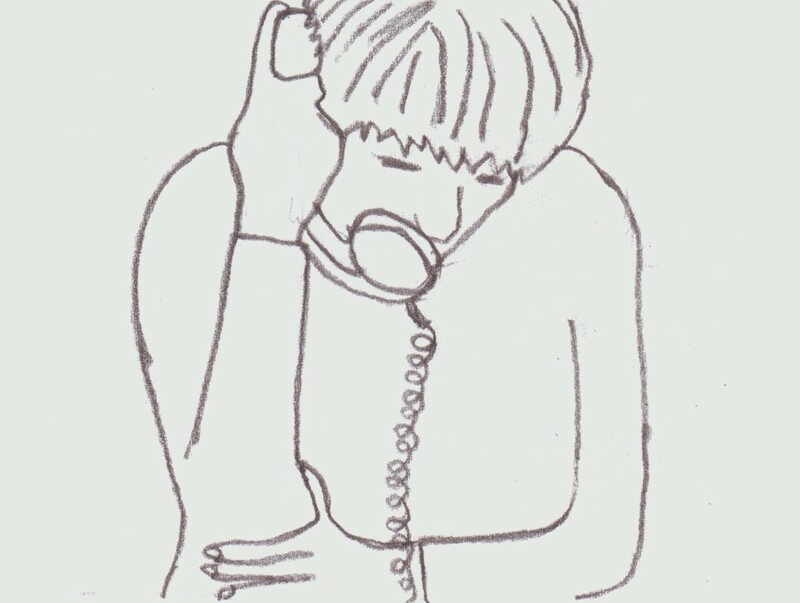 I asked that they (CMHT) refer me themselves to the crisis centre (since they were turning me away) The consultant said "we don’t do that its up to you we will give you there number". Oh can you not feel the care? Its shameful. And so much more. I was scared frightened going out of my mind. And I had no one. My options were not many. And those that I should have either weren’t there or they were cruelly taken away. The Consultant then said I was going to be discharged shortly. I left even more vulnerable and in despair. With no way of knowing how I would cope or survive. 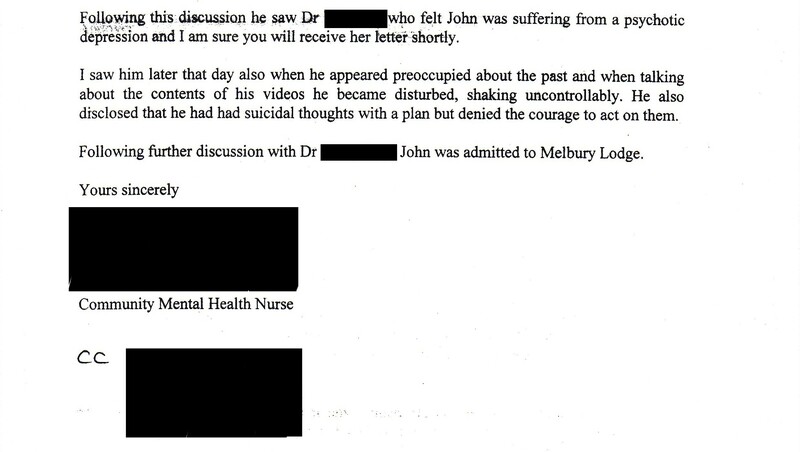 I was Years later then blamed for discharging myself (an ex NHS Trust's chief executives letter found at the bottom of the Documents page) but this was not the case. Look below and you will see a small sample of the notes taken by the nurse that backs this up. I now had to tell my only friends yet again that they weren’t going to help me. But it always seemed like it was my fault no matter who I told. Our friendship would sadly soon end too. It was too much for them as well as me. This I understand. 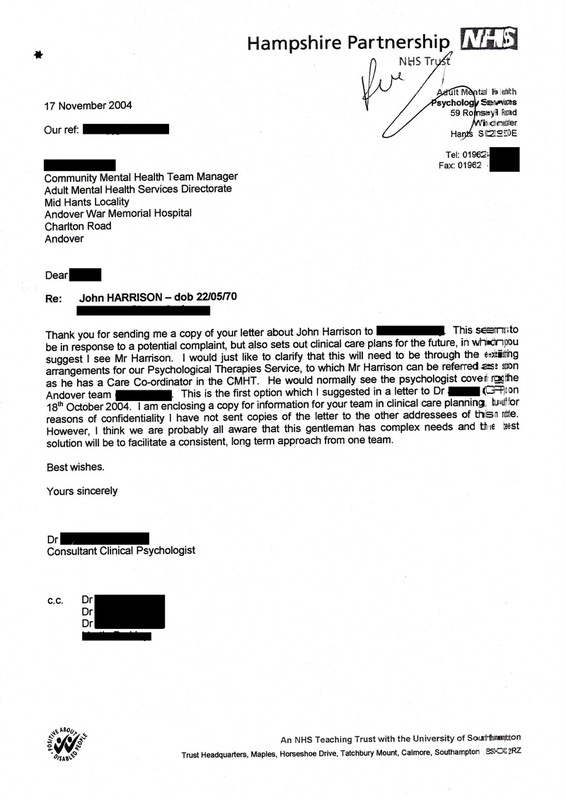 When the chief executive of the Hampshire partnership NHS Trust (at that time) said he Investigated my complaints years later. Where was the mention of Psychotic depression? And were in all of his Investigation (a letter you can find on the documents page) in two written responses did he directly mention the main point on child abuse that I raised on the phone and in writing? he didn’t. Like so much of it I have the clear undeniable proof (within healthcare professionals own letters) to clear my name and show people have a case to answer. But they are the guilty and strong and are protected at all costs. I am the victim the innocent and weak (In law) and so don’t seem to have a chance. That will only be true if WE give up trying. Which I try to explain to so many including the Prime Minister and MP's. All I want is the truth to be known. I don’t have to fear it in a way many do. The CMHT has regularly gone against what they themselves have said. Right up to 2003 saying I had no mental illness they could find. While all these things were going on remembering the vulnerable person who had committed no crime. Is it any wonder I didn’t know whether I was coming or going? Before them let alone after their acts or inactions. Life death. Not only did it not improve with them it got worse. I had to avoid them. Do a runner. And be blamed for it. I couldn’t even bring myself to say "Junction Road" their address. I would say "J Road" real quick. I feared them and with good reason. And people even those around couldn’t see it or in the end started to falter to believe the problem was me I wouldn’t except their help? It was not help what they were doing. Oh yes it was my fault. They continued to fail and be economical with the truth. They had to. Because of the facts. I haven’t seen my GPs I have now for over two years. I have made a statement to them. And had a meeting with the Manager explaining why. It has not stopped with their Dr I believe. And that and everything else I stated to her. And now sadly I cant trust Drs, Hospitals along with all the other people and types who have hurt me who I would find difficult to trust. Of the years its all be compounded and gone on far too long without proper accountability. And no one is held accountable apart from me. The victim. And even the good ones (mostly) believe it is my fault. Or its my attitude. Or because of my past. This wont change until they are made accountable or they are exposed. I continue to try. I believe you can tell from the tone of this letter (and I have many of them) how this Dr is stuck between a rock and a hard place. To say anything specific he knows he would have to directly contradict other Drs. So note at the end of his letter when he writes "However, I think we are probably all aware that this gentlemen has complex needs" Now what was it? I had continuously been told I have no mental illness. Or its depression. Or not. You see until you have true accountability which is down to another body to enforce. And until that body actually does this. Or within the Law you have access to its protection in these cases without these get out clauses of time limits. (Does this happen if you murder someone? of course not) Until then it will continue and we will be unprotected. The law should be the law. Full stop. Until it is this will allow situations like this to continue. And never change. Now I have on other documents got OCD and mentions of other Psychological problems. But the worst of it all was in all of those times and situations when it was obvious to all concerned that I had serious health problems or I was seriously distressed. Whether that was long term or short term. Or whatever it was called. Its not the thing. Its that Andover CMHT (and others) have continuously despite this and what they themselves said at times (well documented) where prepared to deny or ignore it, turn me away with all the serious consequences and permanent damage because of the trauma it has put me through that was totally unnecessary and totally heartless and cruel. I would not do this to my worst enemy. What had I ever done to them? And it is all documented and not just by me. I will expose it fully one day soon. Yet again I hope the reader can see what I am saying is serious, the truth and WE genuinely need to do something about it. 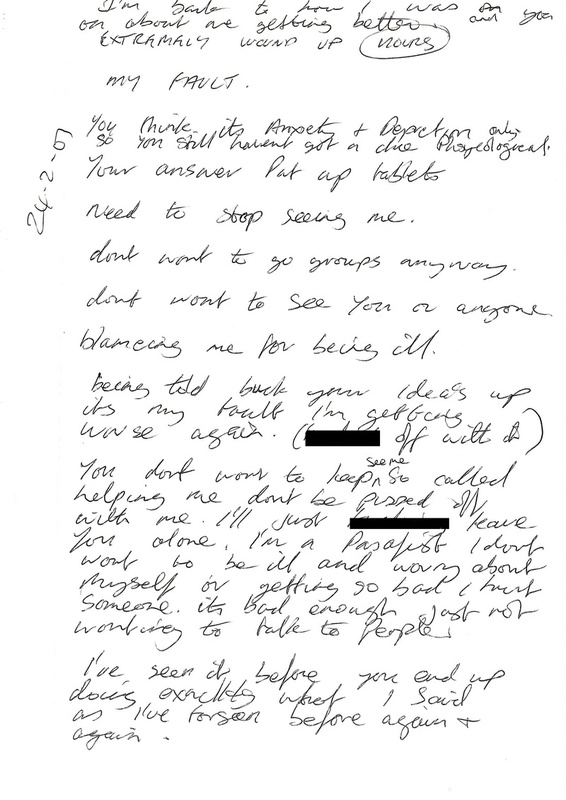 The note below was written 24th February 2001 it is on my Medical records that is how I have a copy. I felt frustrated at the CMHT for legitimate reasons. I was at home I had a drink and wrote this note to my case worker in CMHT letting it out. That person had said it was Depression and if I was not depressed that I would then be OK this upset me and made me angry through frustration. I couldn’t handle it because somehow I knew at the time there was more to it than that. I felt I was trying everything I could to tell them how I felt. I would also like to note it is said on my records that I was not engaging with them at times yet this is not true because when people see my Medical Records they will see at least a hundred A4 pages of stuff I wrote and gave into CMHT saying how I felt. They also said I didn’t keep a record of how I was feeling as they had asked me to. Yet as I said they have over one hundred A4 pieces of paper showing this is not the case. Indeed one of my stays in hospital I did this as well.